I've posted on Google Street View a couple of times, both about introduction of the service to Ireland and also the comic views that turn up sometimes. As I've mentioned several times, the major topic of conversation has always been about people's privacy when it comes to Google roving around taking photos of them in public. To counter this, Google introduced a feature that automatically blurs out people's faces. Interestingly, it's not fussy as to whether they're a real person or not! hahahhahhaahah! How dare you, Mr Hughes! He's every bit as real as his product! I wonder is there an actual SuperMac! For some reason I doubt there's a SuperMac or a Ronald McD. 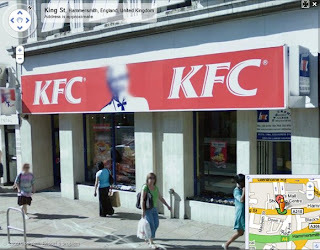 In fairness I guess at least there once was a Colonel Sanders.